The island is surrounded by a barrier reef that protects it from the south Pacific swells, and shelters a beautiful shallow lagoon that extends most of the way around the island. The lagoon has an abundance of fish life, and snorkelling is the go here – it doesn’t get much deeper than a few metres – so diving Rarotonga entails heading out onto the reef outside the lagoon. 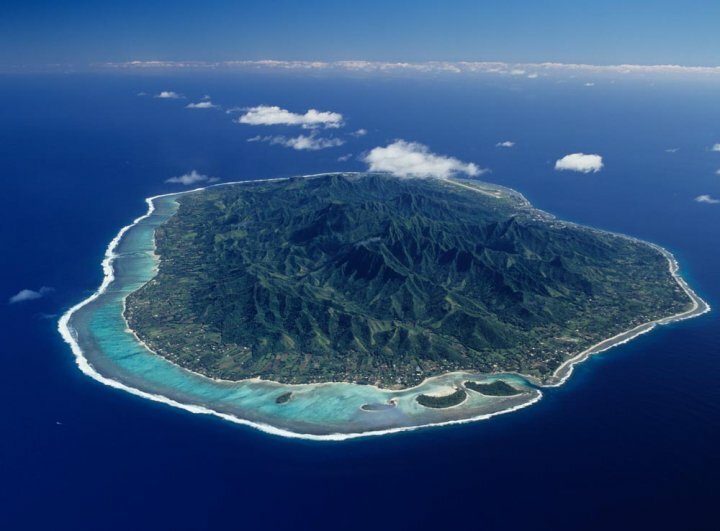 The geography of Rarotonga means that its barrier reef and dive sites are exposed to the elements, and cyclones have wreaked havoc on the reef over the years. As a result, the corals in the area are typically more robust hard corals, rather than soft coral, and the reef is not widely known for its beauty. That said, Rarotonga hasn’t been hit by a cyclone in nine years or so, and the reef is looking good! The marine life is amazing, the coral formations are really interesting, and the visibility is outstanding. 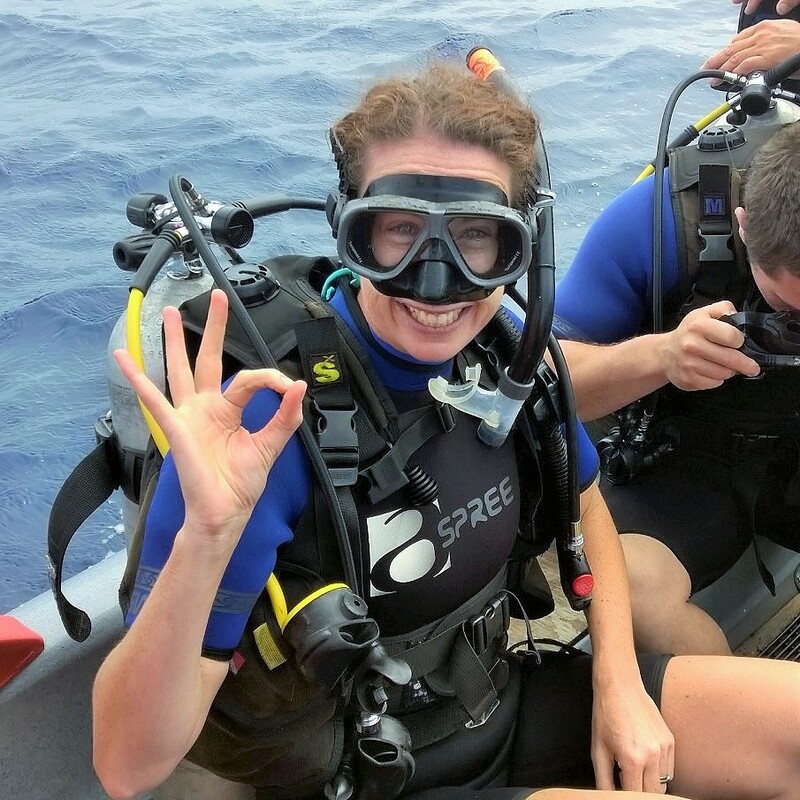 My investigations on TripAdvisor and locally once we arrived on Rarotonga, led me to the team at Dive Rarotonga, and I am confident I found the best dive team on the island. 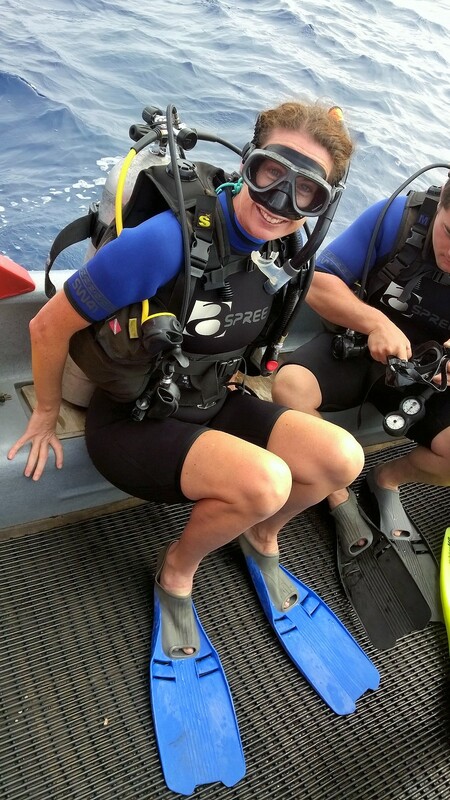 Karen and Ed own the business, and they have led the way on Raro in meeting safety standards, and trying to get other dive operators to do the same. They have also set up moorings at the most popular dive sites to limit damage to the reef, which they’ve encouraged other operators to use. Karen, Ed, and Paul, who is one of the most knowledgeable and enthusiastic dive guides I have met, are all instructors, and are by far the most experienced outfit on the island. A holiday diver, I hadn’t dived for a couple of years, so when I contacted Ed, he suggested a quick refresher in the pool. After Karen ran me through my paces in their 3m pool, I was ready. Karen was awesome – I was totally confident hitting the water again. Leaving our little explorers in the capable hands of Daddy (who is not interested in diving and was probably glad to get rid of me for a few hours), I headed off. Dive Rarotonga’s dive boat is moored in Avarua Harbour, so it’s quick getting in and out to the dive sites. The trip was pretty quick – this was our first stop, just outside the harbour. Excited, much? Ready to go. 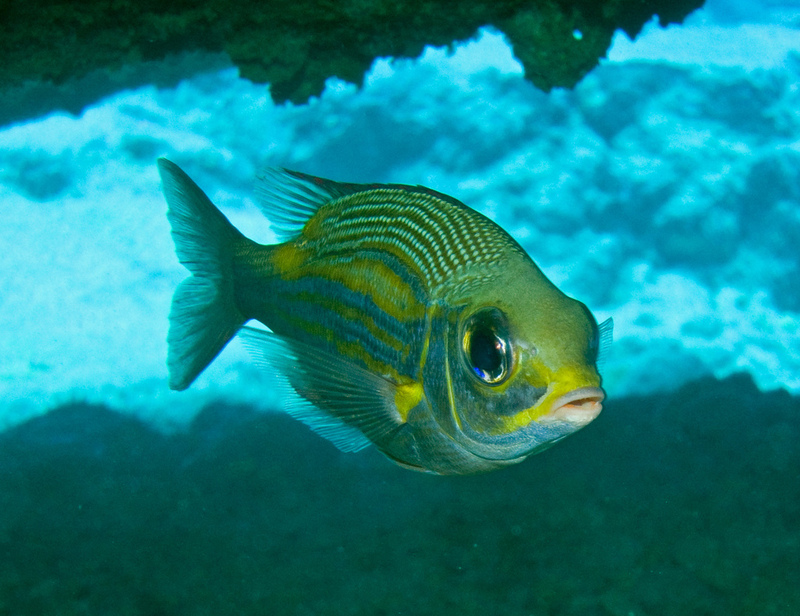 The north shore of Rarotonga has some of its best dive sites, which are all quite close to each other. Edna’s Anchor was our first. Paul told us the story of Edna, who was the skipper of the ship whose anchor lays on the reef below. I wish I could remember all the details – I think the ship ended up sinking somewhere else in the Pacific. Poor old Edna. We were all a bit keen for the possibility of spotting whales. I’d seen migrating humpbacks from the beach the day before, and Karen had seen a couple from the boat while the divers were in the water the day before, too. Unfortunately the divers were swimming in the opposite direction and missed them then, and we weren’t lucky enough to see them, either. Immediately after our descent, we were greeted by two very friendly blue triggerfish. According to Paul and Karen, they know the Dive Raro boat and are quite attached to the Dive Raro team. They are apparently siblings. Don’t they have such a lovely smile? 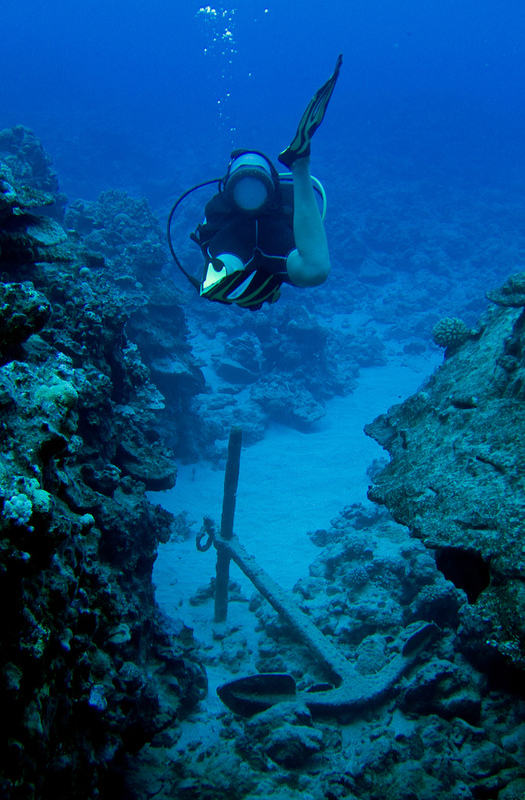 The anchor itself sits at 24m, which we swam over before heading across a sandy slope towards a massive blue drop off. Edna’s Anchor: Ron Caswell on Flickr – used under CC licence. We spotted a giant moray eel, I patted a pineapple sea cucumber, and saw a tiny ghost coral change colour. We also saw this very cool peacock flounder, which changes colour, chameleon-like, according to its surroundings. The coral formations are quite spectacular, if not colourful – notice the pretty little wrasse (I think that’s what it is – wish I could remember more fish names). Whatever it is, there are tonnes of these little fellas around. This area is really rich in coral, and, as the name suggests, much of it is mushroom-shaped. There was so much fish life swimming in and out of the bommies, and hiding under the mushroom umbrellas. We spotted a massive crown of thorns starfish, and even though they’re everywhere, I always love seeing moorish idols. They have such cute noses. This will give you an idea about the mushroom-shaped coral. Visibility on both dives was around 40m – amazing! On my second day diving, we hit the M.V. Mataora wreck; another north coast dive spot. The Mataora was a Tongan cargo ship, which was purchased by the previous owner of Dive Rarotonga in 1990 for $1, and sunk on the reef off the north coast of Raro as a dive site. Unfortunately, she didn’t stay intact for long, and was broken up by a series of cyclones. Pieces of the wreck now lay 18m below the surface, and are home to a host of sea creatures, including a couple of fire lion fish, who have found a cosy home in the ship’s stern. We spotted two of these spiny fellas, as well as butterflyfish, yellowspot emperor fish, goatfish, bannerfish, and moorish idols, plus a tonne of pineapple cucumbers, and another peacock flounder. It was beautiful to see how nature was taking over the wreck, with coral and seaweed swallowing the ship’s pieces. This was my last dive, and it was arguably the most beautiful spot on my Rarotongan underwater adventures. Our two blue triggerfish friends were back, the coral was lovely, and the dive at a depth of 16m max, The fish life was phenomenal. I really wish I knew the names of all the fish I saw so I could list them. They were everywhere! Beautiful, colourful, tropical fish – wrasse, parrotfish, butterflyfish, and spotted tobys. Here’s a cutie. And the piece de resistance, just before our ascent back to the boat, was the appearance of a shy white tip reef shark, who came by for a little look, before darting off behind a bommie and into the blue. 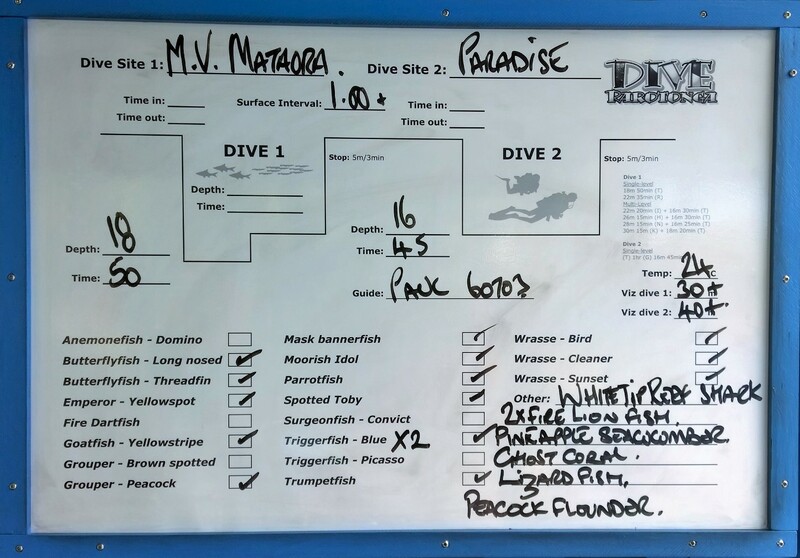 And THAT is this little holiday diver’s awesome experience of diving in Rarotonga, made that much more fun by the crew at Dive Rarotonga, who do what they do with passion. As Ed said to me, “Someone has to live here.” Yeah, that must be really hard. Until next time, enjoy the deep blue! That looks great! Especially the underwater photos, came really out really clear and the sea is so blue.